James Blue held that landscapes were important both in his own life and in his films. The landscapes of his life between his birth (1930) and the making of The March (1963) help explain his development as an artist. His experience studying in Paris and making The Olive Trees of Justice prompted an epiphany that he was rooted to and belonged in the United States. James Blue (1930–1980) was born in Oklahoma. His family moved to Portland, Oregon, when he was 13. 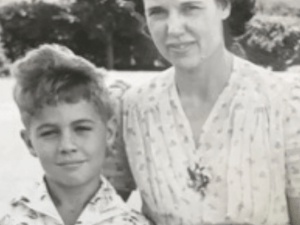 He struggled with a racist mother who was a member of the John Birch Society. He graduated from Portland’s Jefferson High School and then, in 1953, from the University of Oregon, with majors in theater and speech. James Blue with his mother, late 1930s or early 1940s. Photo courtesy of Suzanne Clark. You can view many of James Blue’s films, including some he made as a student, on YouTube, or read his complete filmography at the James Blue Project. At the UO, Blue studied theater with Horace Robinson (namesake of the Robinson Theatre), speech with Robert D. Clark (namesake of the Clark Honors College), and radio and television production with Glen Starlin. Blue starred in several plays and worked for KWAX radio station as a producer. Blue and James Ivory (who would later emerge as a major figure in the film world) learned French in the same classes. Robinson, Clark, and Starlin recommended Blue for the prestigious graduate program at the Institut des hautes études cinématographiques (IDHEC) in Paris. Blue entered IDHEC in 1958. There he was exposed to cutting-edge French film theory, including the writings of André Bazin, Chris Marker, the “new wave” and the cinéma vérité movements, which influenced his direction of The March. After graduating from IDHEC, Blue directed eight shorts and one feature film, Les oliviers de la justice (The Olive Trees of Justice), in North Africa. In 1962, he made three films in and about Colombia (his “Colombian Trilogy”): Evil Wind Out, A Letter from Colombia, and The School at Rincon Santo. Although his experiences in France and Algeria allowed him to develop his capacities as a filmmaker, Blue recognized his need to return home. In a 1963 interview with Mary Batten, Blue compared his experience with that of the protagonist, Jean, in The Olive Trees of Justice. Jean had left his home country of Algeria for France, thinking he would not return. Yet the lure of Algeria was too strong to resist when Jean’s father, mother, childhood friends, and the Algerian culture remind him of his background, heritage, and responsibilities. Algeria’s attraction for Jean prompted Blue to consider the similar ties that yoked him to the United States. In an interview with Mary Batten, Blue makes explicit the similarities between Jean, the protagonist of Olive Trees, and himself, and between the problems of racism, identity, and violence in Algeria and those in the United States. Blue witnessed bombings during the civil war in Algeria. When he returned to the United States in 1963, the country was suffering through a violent summer of racial violence. What was very important for me in making this film … was that I found out what roots I had in America and how much I belonged in America. The parallels between Algeria and America were enormous as far as I could see, not only from the racial standpoint – the race problem had a different aspect there; it wasn’t a color problem, but nevertheless, it was pretty acute. It was the thing that created the Algerian war. I think that it’s very important to get away, to be able to see your country better, as another country and not as the only way the world is. In Algeria I found a younger America, with more essential problems at hand. In Algeria it wasn’t making a buck; what was essential was whether you were going to live. You had the feeling that the fate of a nation depended on people getting along together. Well they didn’t get along together and the nation split apart. BATTEN: More and more the United States is reaching that point. BLUE: We’re going to reach that point. I think we are. BATTEN: Birmingham certainly demonstrates the necessity of people getting along with each other. BLUE: I think that Birmingham is just one little outbreak of a problem that’s in the blood of America, that can break out anywhere. We’ve got to cure the source. The fate of Algeria, as part of France depended upon integration – whether people could live together without one group being superior to the other. Even the best paternalistic situation is unbearable because people now have realized that no one can lord it over anyone else. Certain elements believed that there was no way to French and Arab understanding, that Algeria was always destined to break away and to become independent. I think there was hope for a French Algeria if it had been humanly and equitably regulated from the first; but of course there is always the question of original sin in a conquest. For more on James Blue’s life and work, visit the James Blue Project and the James Blue Alliance. The following documents come from the James Blue papers (Coll 458), Special Collections and University Archives, University of Oregon. They are reproduced with the permission of their copyright holders. “James Blue (the Olive Trees of Justice).” Film Comment, 1963, 10. Batten, Mary, and James Blue. “Interview with James Blue.” Film Comment 1, no. 5 (1963): 2-14.